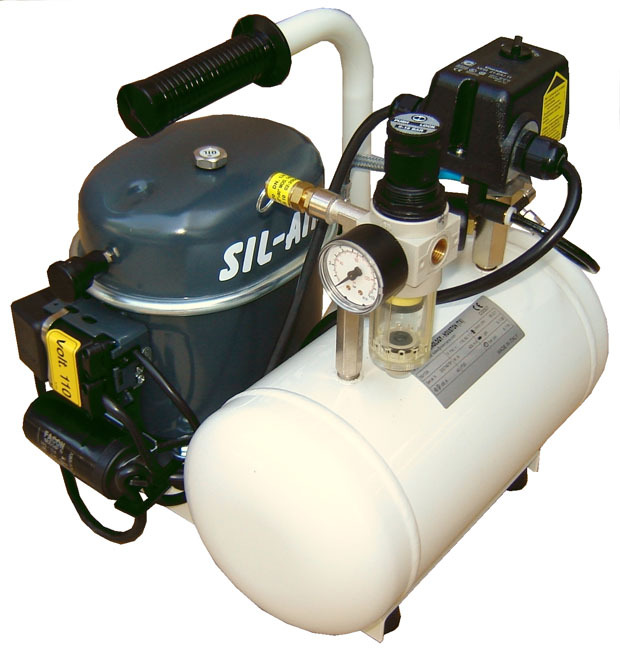 Dimensions: 14.2" x 13.8" x 13.4"
This Silentaire Sil-Air 50-6 Air Compressor is one of the high-end developments of Silentaire Technology. For consecutive years, Silentaire Technology delivers high-quality quiet air compressors worldwide. Due to the reliable operation and dynamic product development, Silentaire compressors have won over many loyal customers in more than 150 countries. That's why the company has gained a solid reputation as a leading manufacturer of airbrush compressors and it is one of the largest producers on the market. With modern production methods and ongoing research, the company aims to create air compressors that fully respond to the customers' demands. For this reason, Silentaire Technology carries a wide range of different compressors that make airbrushing even more enjoyable and cost-effective. a carrying handle or wheels that let you move the compressor around in comfort. Apart from that, the package contains an oil bottle type ROLOIL - SINCOM/32E, instruction manual, and a tank certificate. We recommend that you do not exceed an average duty cycle. It means, after every 15 minutes of the compressor operating cycle, you need to let it rest for 15 minutes. It is necessary for the correct operation and lifetime extension of the compressor. Failing this, overworked duty cycles can cause overheating and increase oil consumption. Besides, this can reflect on the performance of the compressor. The 12-months guarantee on this compressor gives you the right to get the defective parts repaired or replaced free of charge. A warranty coverage starts at the time of purchase. Please note that only the manufacturer can recognize parts as defective. In case, the inspection reveals tampering or bad usage, this will automatically terminate the guarantee. Also, the warranty is not applicable to the electric parts and worn parts. 17" x 15" x 15"